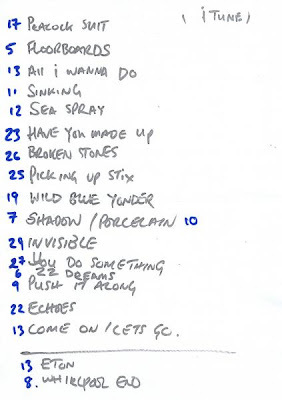 Paul Weller iTunes Festival Picture & Set List! For thirty years, John Weller managed the career of his son Paul, through the salad days and success of The Jam in the Seventies and early Eighties, the ups and downs of The Style Council and Paul’s re-emergence as a solo artist in the Nineties. Theirs was a unique father-son relationship in the music industry, built on John’s unwavering belief in Paul’s talent and shared values like hard work and pragmatism. John could be blunt, and once refused to have lunch in a record company’s executive dining room, remarking to the managing director: “I didn’t come here to eat, I came to do business.” But his bark was worse than his bite. Where else to meet the musician son of the agelessly groovy Modfather but at London’s trendy Met Bar? And there’s more than a hint of moody Mod style about the Japanese parka that Paul Weller’s eldest child Natt has slung over his Vivienne Westwood top. Yet there all similarity ends, for singer-guitarist Natt has inherited the exotic beauty of his mother – former Wham! and Style Council backing singer Dee C Lee – rather than the famously angular features of his father. ‘Everybody always goes, “Luckily he took after his mum…”’ laughs Natt, whose mother is from France and St Lucia and whose great-great grandma was Japanese. Hence Natt’s fascination for Japan, where he moved in 2006 for a year to learn the language. It wasn't unexpected to get the news that John Weller had passed away , it was a beautiful sunny morning in fact , but the news still stung even though the anticipation existed . I finished work today , a day peppered by texts and calls , I missed the call that mattered but made ammends and spoke to the one person I needed to speak to , I raised a glass at dinner and reminisced with my beautiful partner of days of travel and nights of glory that followed , and after a little to much wine the drowsiness lifted and the harsh reality that someone very special had passed hit me , I wanted to say that , with my emotions bubbling very much to the surface , I wanted to remember those decades and shows and nights that we all spent together , indestructible , laughing and making the music of our dreams , wide eyed vagabonds not quite believing . New York Daily News Reviews "22 Dreams"
A Few More North American Reviews Of 22 Dreams. "Shout To The Top" Coming To Paperback! Paul Weller On John Lydon! 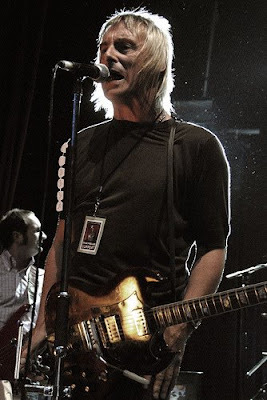 Paul Weller Chat Forum Relaunched! Paul Weller Chat Forum - New Address Info!